The Amalfi Coast is one of the most famous and pleasant places of Italy: this is hte name of the southern coast of the Sorrento Peninsula, towards the gulf of Salerno. Here the naturalistic beauty meets the culture and the traditions; the coast takes the name from the town of Amalfi, geographic and cultural center of the area. Following the road that goes along all the coast is a unique experience: every town is strongly proud of its history and in every town there is a monument, a church, a landscape that makes the tourists stop to enjoy this wonderful place: the Amalfi Coast is formed by of thirteen towns, one following the other, between bays and cliffs on the sea. The numerous gardens that are used to cultivate the citruses are the characteristic of this place: the lemons of the Amalfi Coast are famous because they are used to produce the limoncello, the aromatic yellow liqueur with a wonderful scent of lemon. 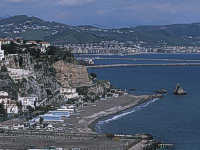 The city of Vietri sul Mare rises in a small and evocative gulf at the beginning of the Amalfi Coast. 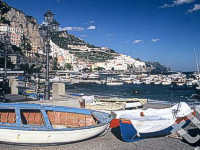 Small seafaring town, Cetara is a paradise dipped in the nature, between sea, citrus groves, barren and impassable zones; it is one of the most characteristic towns of the Amalfi Coast. 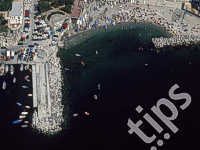 Amalfi is the capital of the Coast that from this city takes its name; it is an important city from the historical, artistical, economic and cultural point of view. Conca dei Marini is one of the most evocative towns of the Amalfi Coast: the small white houses of the bay remember the ancient sea village, and they form a picturesque panorama.